The leopard panthera pardus is the most wide spread and adaptable of the big cats. Because of its wide distribution there is extreme variability in coat colour. This can range from greyish yellow to a rich buff or chestnut colour, there are black spots on the head, lower limbs and tail and black spots that form rosettes on the back, flanks and upper limbs the underside of the body is whitish in colour, of this sleek, athletic body. Coat colour is broadly associated with habitat type. 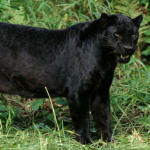 Melanistic leopards called "black panthers" are very common, especially in dense forests. The head is relatively small and convex in profile, the ears are rounded. The legs are rather short and stout and the tail is long and full. Mostly active during dawn and dusk but will hunt in the day, hunting is accomplished mainly by stalking, approaching their prey as close as possible before pouncing. Depending on the species of leopard, the size ranges are as follows : head and body length 91cm-191cm, tail length 58cm-110cm, shoulder height ranging from 43cm-76cm and leopards can weigh between 30kg and 91kg. The puma Felis concolor probably has as many different colloquial names as it does alleged geographical races. It also has the greatest latitudinal distribution of any wild cat species, being found in all habitats in its native country, North and South America. Because of their immense range, there is a wide variation in coat colour, from a buff or sandy-brown to reddish-brown, through to a light silver and slate grey. Black pumas have also been reported. The coat is fairly short and coarse, being somewhat darker on the back and a paler buff on the chest, belly and inner sides of the legs. Overall the coat is uniform in colour and is essentially unmarked. The head is fairly small, with dark brown to black patches on the muzzle which is also lighter in colour. The eyes have irises of greenish-gold to yellowish-brown. The ears are short and rounded and grey to black on the backs. The forelegs are shorter than the hind legs and the foot pads are relatively large. Their tail is fairly long, gradually darkening towards the tip. Primarily nocturnal and crepuscular, they hunt over a wide range carefully stalking their prey or dashing out from an ambush point and rushing straight at the prey, often breaking the ribs of the prey animal - such is the speed and force used to knock down the prey. 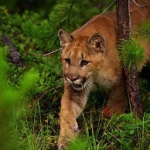 The size of pumas varies according to geographical location but as a guide they measure around 97cm to 220 cm head and body with a tail of around 53cm to 82cm, the height at the shoulder would be between 58cm and 76cm and weight between 35kg and 85kg. The Eurasian cat tends to have more dark, distinct spotting on its coat than the Canadian. 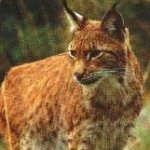 This is shown to the extreme in the Iberian or Spanish lynx, which is always heavily spotted. Northern animals tend to be greyer and less spotted than southern animals. In the south west area of their range, three coat patterns are recognised - predominantly spotted, predominantly striped and unattended. In Scandinavia, spotted cats are called "cat lynx", and unspotted ones are called "wolf lynx". Summer coats usually have dark spots that fade to barely visible in the winter. The usual ground colour of the fur is a greyish or brownish-yellow but can vary to rusty or reddish-brown. Their thick, soft pelt can be variably marked with more or less distinct dark spots and sometimes small stripes. There is a distinct ruff of long hairs framing the face. The ears are large and pointed with long, erect tufts of dark hairs and the backsides are black towards the tip, showing light central spots. The rises are a yellow-brown to a light yellowish-green in colour. The legs are long, with the rear limbs longer than the front ones, giving the body a tilted forward appearance. The footpads are broad and well furred and the tail is very short and black tipped. The Iberian lynx preys almost exclusively on European rabbit, although some deer fawns and birds are also taken and they are capable of killing prey three to four times their own size. Occasionally domestic sheep are also taken. The Eurasian lynx is the largest, with males averaging 21 kg and the females averaging 18 kg. The Iberian lynx is intermediate, with males weighing on average 12 kg and females slightly smaller and the Canadian cat is the smallest, with males averaging 10 kg and females averaging 8.5 kg. Height at the shoulder is between 65 and 75 cm. The Jungle cat (Felis chaus) is not a frequenter of jungles as the name implies but prefers moist areas with reeds or high grass, woodlands and agricultural crops. The coat colour of the jungle cat varies from sandy or yellowish-grey to a greyish-brown or tawny red, with underparts of cream or pale rufous. The legs sometimes retain horizontal striping melanistic (black) - individuals are reasonably common. The head is narrow and has a high domed forehead. The ears are tall and rounded and tipped with small tufts of black hair and are set close together. The eyes have bright yellow irises, the legs are long and slender and the tail is comparatively short with several dark rings and a black tip. Average length for jungle cats is 500-850mm with a tail length of 230-290mm. The height at the shoulders is 350-380mm and the cat can weigh 4 to 13 kgs. Caracal (felis caracal) means "black ears" in Turkish. Large tapering ears with up to two inch erect tufts of black hair used for communication. Black backed ears, dark spots on both sides of the muzzle, black spots above the eyes and a black stripe from the eye to the nose. The coat is a uniform tawny-brown to brick red colouring, the short dense coat is slightly longer and whiter on the underside. Melanistic (black) caracals have been reported but only rarely. Called "desert lynx" the caracal has longer legs, a slender body and the tail is longer and tapered at the tip. They lack the ruff of hairs around the face which are predominant in the lynx. The eyes are large and yellow-brown in colour, their sight and sense of hearing is very good. As with most cats it is predominantly nocturnal and hunts birds, rodents, reptiles and larger mammals (water buck etc). It has a remarkable ability to jump several feet into the air to knock down birds as they take off. Found in both Asia and Africa, the females being smaller than the males, the size ranges for this cat are as follows: 88-98 cm in length with a tail length of 24-38 cm long, height between 40 and 50 cm and weighing anywhere from 10 to18 kgs. The wildcat looks like a larger and heavier version of the domestic tabby cat but is a distinct species with sub-species throughout Europe and beyond. Characteristically it has a broad face, very obvious body stripes and a thick, striped, blunt tail. Like other small cats it feeds on a wide range of mammals and birds and can be found both in wooded and open country. Mainly nocturnal, the wildcat is secretive and very rarely seen. 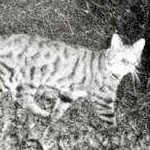 In the early part of last century the wildcat had been reduced to a population in the north-east of Scotland but we now know that it is widespread throughout mainland Scotland north of the Central Belt. Although unofficially the wildcat has spread much further than this and sightings have been made in all parts of Scotland, especially over the last few years.